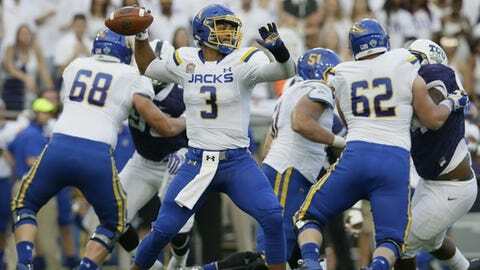 (STATS) – NFL fans will be learning about South Dakota State’s dynamic senior receiving duo of Dallas Goedert and Jake Wieneke next year, if they aren’t familiar with them already. The quarterback getting them the ball the last two years is junior Taryn Christion. The 2016 offensive player of the year in the Missouri Valley Football Conference was at it again on Saturday, posting one of the better games of his career with Goedert and Wieneke the big recipients as usual. On Monday, Christion, Bryant’s Thomas Costigan, Austin Peay’s Kyran Moore and Yale’s Zane Dudek were honored as the STATS FCS National Players of the Week for Week 9 games ending Oct. 28. In a matchup of Missouri Valley teams ranked 11th and 12th, Christion accounted for six touchdowns and 423 yards of total offense to fuel the Jackrabbits to a 52-24 road win. The dual threat completed 26 of 41 passes for 386 yards and five touchdowns, and carried the ball eight times for 37 yards and a TD. His five scoring passes tied a career high and covered 30, 13, 1, 46 and 6 yards. Bryant hadn’t won a road game in coach James Perry’s first season and had only one in its prior 11 attempts before it registered a 31-16 Northeast Conference victory at Wagner. Costigan was in on 11 tackles, including 10 solos, with four tackles for a loss, two sacks, a forced fumble, a pass breakup and a quarterback hurry. Nine of his 11 tackles limited Wagner’s offense to a 3-yard gain or less. He sacked quarterback Luke Massei on the Seawolves’ first drive, forcing a fumble that was recovered by a teammate and led to the Bulldogs’ first points of the game. Austin Peay hung with unbeaten UCF for most of the first half before falling 73-33. Moore racked up 233 yards on eight kick returns (a 29.1-yard average), including a 93-yard touchdown that pulled the Ohio Valley Conference squad within 38-26 in the final two minutes of the second quarter. He also caught five passes for 130 yards, including a 35-yard TD, to finish with 363 all-purpose yards – the Division I high this season. Dudek totaled 218 yards from scrimmage as Yale defeated previously unbeaten Columbia 23-6 and moved into a three-way share of first place in the Ivy League. He tied his career high with 173 rushing yards, providing Yale with a first down on 10 of his 25 carries. He also caught four passes for 45 yards. Dudek, a cousin to former NFL quarterback Gus Frerotte, carried the ball 11 times for 83 yards on the Bulldogs’ final two drives as they put away their sixth win.